Chess.- Greco (Gioachino) Primo modo del gioco de Partito che giocandosi spesso occorrono li veri giochi & anco questi giochi de Partito sono tratti necessarij, perche al fin del giocho spesso occorrono essendo in essi molti tratti bellissimi & occulti, col'istesso ordine delle Pedine. Composto per Gioachino Greco Calabrese, 62 ff., unfoliated, title within an oval floral and foliate border, a putto at the top (smudged in places); border framing the opening of text on fol. 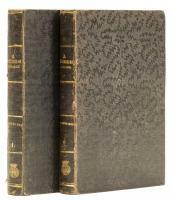 2r., a few annotations in French to the final blank leaves, not relating to the text, with the names 'Robert' and 'Louis' inked on the verso of the first leaves and at the end, along with some pen trials, contemporary French, possibly Parisian binding, gilt-tooled brown morocco over pasteboards, covers within two elaborate frames; cornerpieces, large fleuron, flat spine, richly tooled, head of spine repaired in a lighter coloured brown modern calf, rubbed, 126 x 84mm., binding 129 x 91mm., France, [?Paris], 1624 or 1625. ⁂ A collection of partiti, or 'chess problems' by one of the most important figures in the history of chess, Gioachino Greco (1590/1600 - ca. 1630) called 'The Calabrian', from his hometown Celico, near Cosenza. Greco is considered the first professional chess player. He wrote in 1619/1620 his Trattato del nobilissimo gioco de scacchi, which circulated widely in manuscript, and was highly appreciated in the whole of Europe. He travelled extensively through France, England, and Spain. The highly commercial Greco often compiled small-format manuscripts for presentation to wealthy patrons, generally written, as here, in Italian by copyists and variously decorated by local artists. Each volume was produced according to a patron's individual preferences, a feature which increases significantly the interest and value of Greco's manuscripts in their individuality. Moreover, although the vogue to buy such pocket handbooks was widespread, only a small number of them have survived, owing to their extensive use. The present manuscript was produced in France, and in all likelihood in Paris, the city to which Greco had returned in 1624, after his successful stay in London. The manuscript is undated, but its handsome gilt-tooled binding, recalling Le Gascon's style, and the floral border framing the title confidently indicate the years 1624-1625 as date of its production. 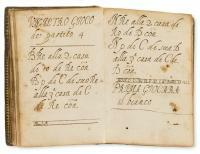 It is one of Greco's earliest manuscripts recorded by Sanvito in his reference work I codici scacchistici di Giulio Cesare Polerio and Gioacchino Greco. Similar manuscripts are found in institutional libraries, including the British Library, the Bodleian and the Bibliothèque Nationale. The one preserved in the National Library in Lisbon (MS H.I.3) bears the same title as ours, Primo modo del gioco de Partito. J. G. White, Greco and his Manuscripts. Giachino Greco 1600-1634. 300th Anniversary of the Writing of the First Manuscript 1619-1919, Philadelphia 1919; D. Hooper - K. Whyld, The Oxford Companion to Chess, Oxford 1996, pp. 133, 158-159; A. Sanvito I codici scacchistici di Giulio Cesare Polerio e Gioacchino Greco, Brescia 2005.